Picture this, you wake up and you're having the best hair day ever. You look outside, and you see that it's POURING RAIN. You step outside with your umbrella in hand, and immediately your hair looks like this. Although we all love Kris Jenner, having hair like this on a rainy day is not ideal. So today we're going to take a look into what exactly the rain does to your hair, and how to continue your good hair day with ease. First, why exactly does your hair frizz on a rainy day? Let's dive in and learn how the hair works on a microscopic level. Frizz is usually caused by lack of moisture in your hair. Let's say your hair is dry and you go outside when its rainy and humid, your open hair cuticles will want to absorb this moisture, and then WALLAH you look like this bunny. 1. 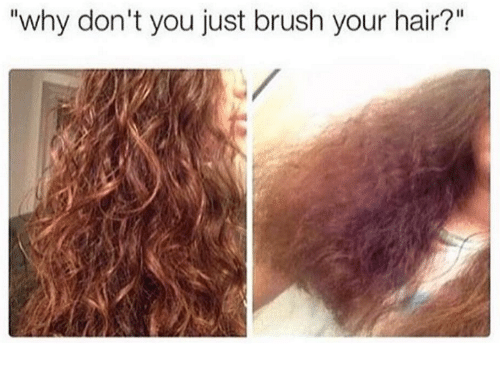 Never Brush- Never ever under any costs brush your hair if you are prone to frizzing, not only will this frizz your hair but it will damage it. Instead, make sure to use a wide tooth comb when you wake up to detangle your hair. 2. Sleep in a Silk Scarf- If you can't afford to get silk sheets for your bed, just wrap your hair in a silk scarf before you go to sleep. This keeps all the moisture in your hair so that your hair won't want to absorb the moisture from the air. 3. Make Sure Your Hair is FULLY Dry- You'll want to make sure that after your shower that your hair is completely dry. Leaving your hair damp is just asking for frizz! 4. Follow the 90/10 Rule- Although it may seem desirable to just blast your hair with high heat for all you impatient people out there. You should make sure that your hair is 90% air dried before you blow-dry the last 10%. This keeps the frizz at bay from the start. 5. Don't Always Shampoo- Twice a week it is a good idea to add some extra moisture to your hair and not use shampoo. Conditioner contains a small amount of surfactants which clean your hair, without stripping your hair of its natural oils and moisture. Choose a conditioner infused with argan oil to get the most moisture, like the conditioner from our Argania Line here. 6. Less Is More- Some of your go-to hair products may work every day, but don't be fooled, the extra moisture in the air will make your products act completely different than they usually do. Try your best to use little product on the days it rains. 7. Messy Bun It Up- This one explains itself, it may be your best bet to put your hair up in a messy bun while it's still damp, that's if you don't want to brave the humidity. 8. Braids Are Your Friend- On a rainy day, it may be your best bet to braid your hair. Braiding your hair keeps it in place and gives it less of a chance of puffing up with the excess moisture. But remember, the curlier your hair, the tighter the braid should be. Follow these tips and a rainy day can be just like every other day. Don't the rain give you a bad hair day, your hair will look beautiful, good luck out there!